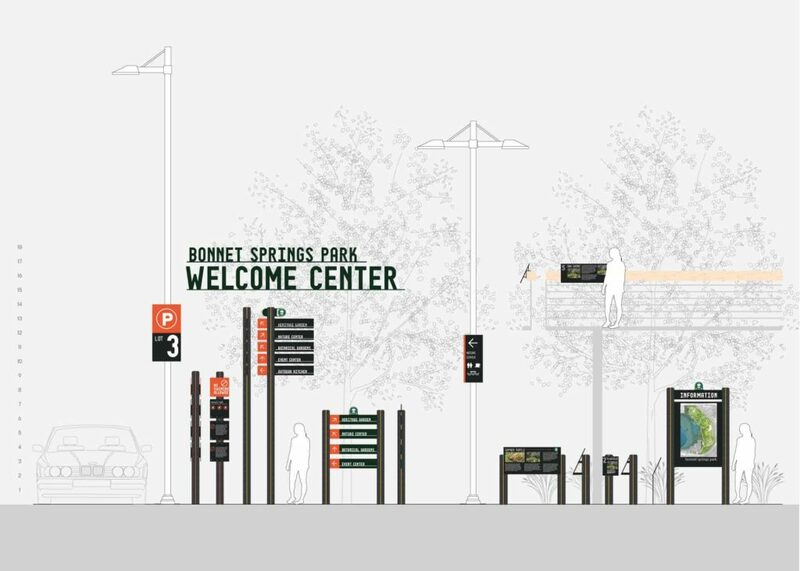 Over the past several months, the Sasaki team has been developing a wayfinding and signage program for Bonnet Springs Park. Our methodology combines typographic design, branding, and wayfinding into a seamless, integrated system. 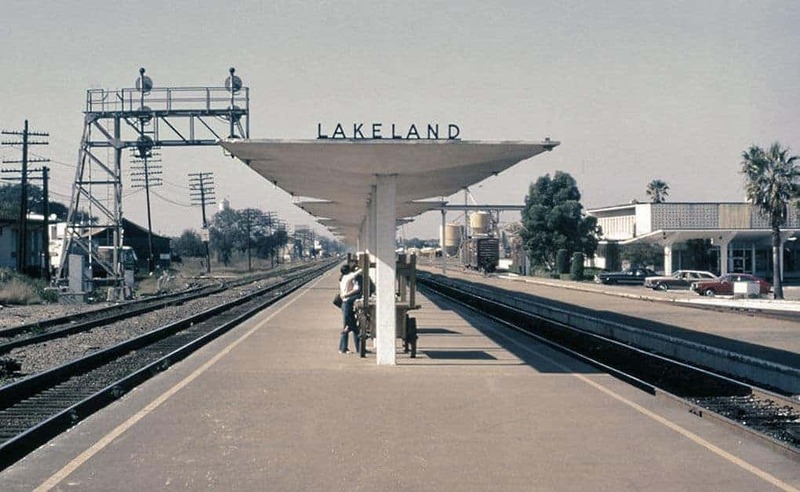 Working to understand what visual elements reflect the sense of place, graphic designers at Sasaki referenced historic photographic records of Lakeland. The team found inspiration in the typography of orange crate labels, stencils, train schedules, building facades, and city signage present in photographs from the early 1900s to present day. This depth of research into place is an important step in understanding familiar visual histories, as well as how to assimilate the aesthetic trends from the city’s past into designs for the city’s present and future. With the goal of creating a highly recognizable and flexible brand and signage system, the team designed a new typeface for the park’s signage needs. Alongside the new type design, a material assembly method that borrows from the site’s train station vernacular is being developed. 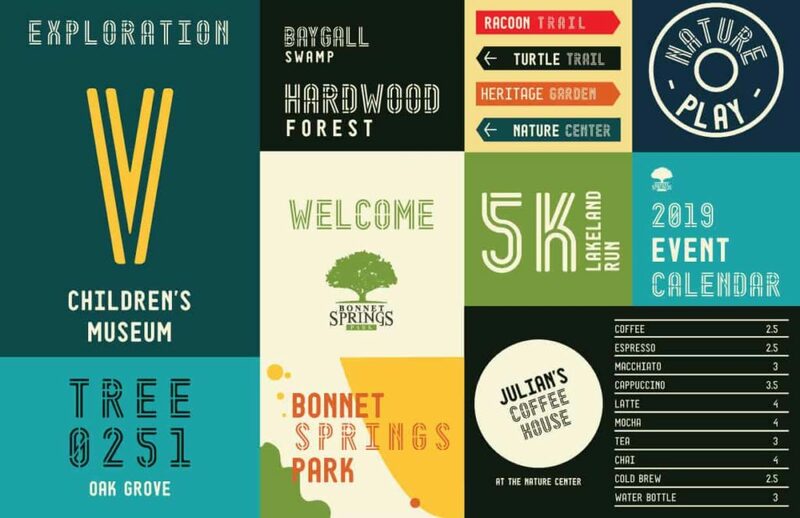 The creation of a custom typeface responds to the need for a direct line to the narrative of the site’s history, as well as establishing the aesthetic relationship between the new park and the city of Lakeland. Utilizing a new typeface is also an effective method to develop a strong and consistent visual expression of a brand, as in this case, the brand for a transformative new park. Dispersed throughout the entire 180-acre multi-feature park, the signage and wayfinding program aims to capture the unique aesthetic qualities of the landscape, highlight aspects of the site’s history, create a recognizable visual style and engage visitors with clear orientation throughout the entire park. 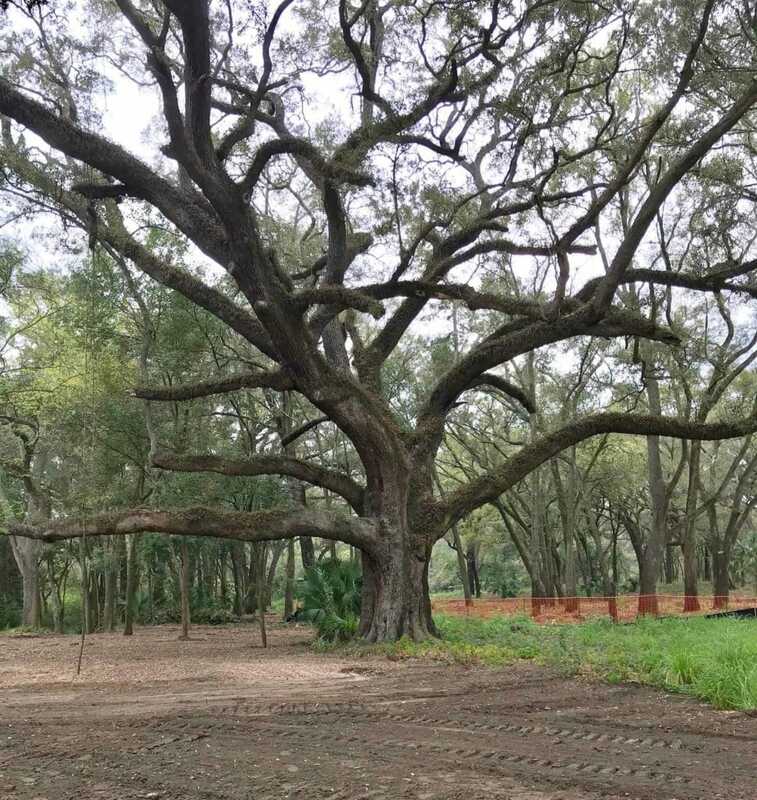 Grandfather Oak, the 75-inch DBH Live Oak that is located below the former activity of the Lakeland Railyards, is one of the many inspirations for Bonnet Springs Park. Left to tend for itself near this harsh industrial environment is a testimony to Mother Nature’s ability to withstand 200 years of challenges from hurricanes, droughts, floods, and most recently, man. 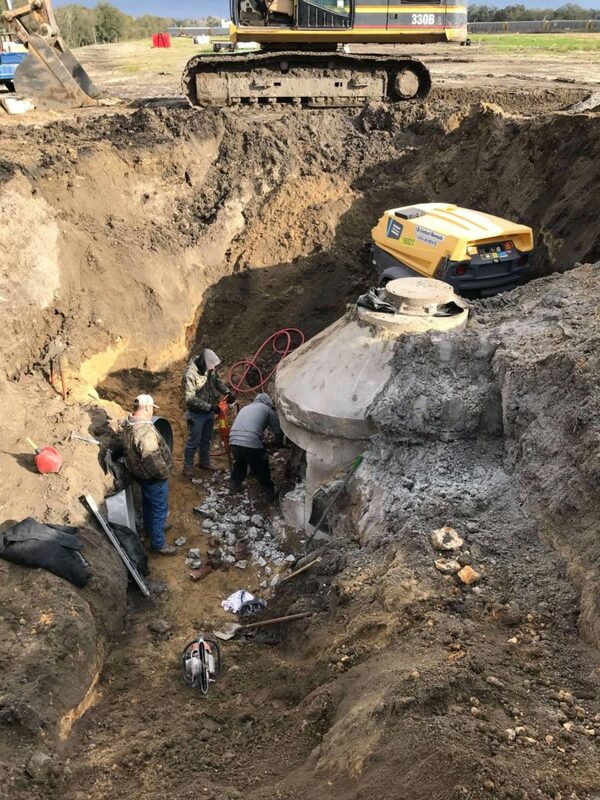 The Grandfather Oak, which has become the icon for Bonnet Springs Park logo, faced its greatest survival challenge from erosion of her foundation roots as water from surface drainage from the railyard, combined with the routing of the FDOT pond’s 30” overflow pipe threatened her ability to stand. 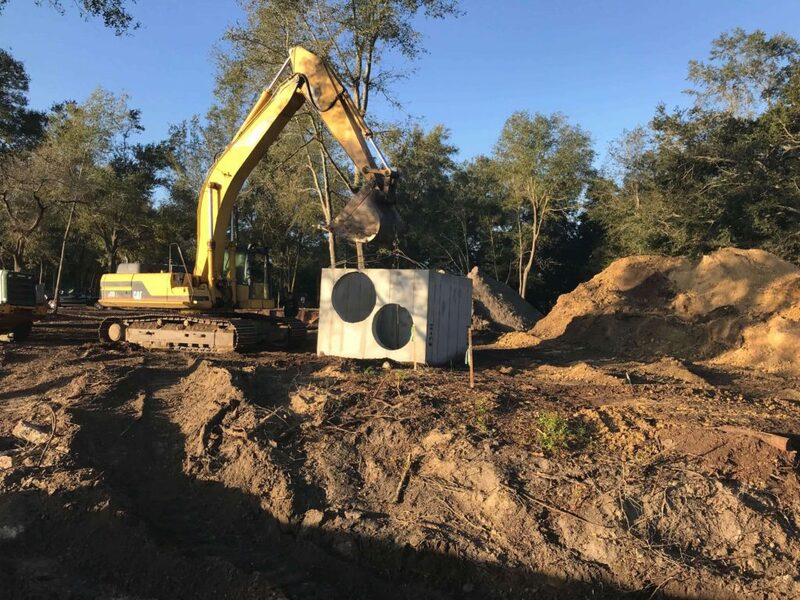 Hurricane Irma took a significant toll on her neighboring trees as at least four major 30-40 inch Oak trees fell due to the intrusion of this unwanted water. As an intervention, the BSP team elected to relocate the storm water overflow pipes, routing them past this majestic tree. Surface drainage as well was relocated. 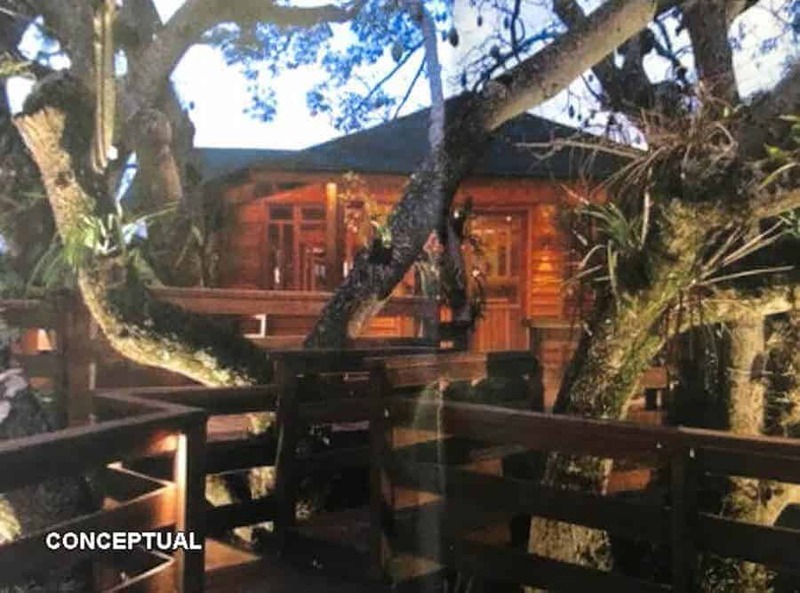 As seen in the series of photos below of this effort, our Grandfather Oak has a much higher survival rate and stands to be admired for many years to come. 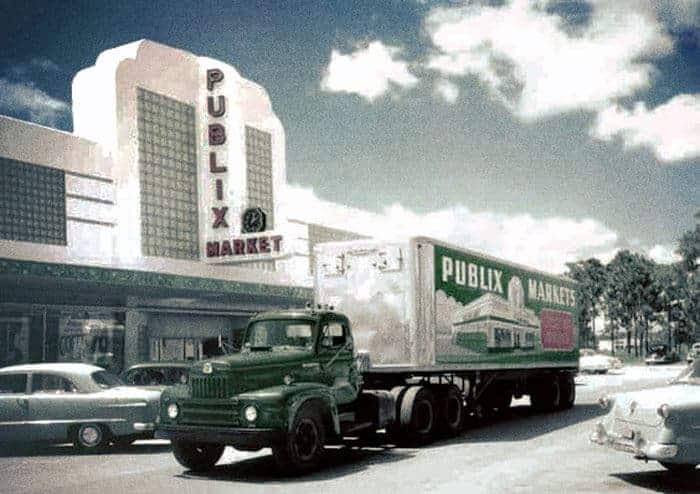 Although the cost of construction was born by BSP, both FDOT and the City of Lakeland cooperated in the relocation efforts and as a result, future generations will enjoy this natural wonder. It is generally acknowledged that the principal ingredients of the greatness of America are its economic engines, military might, natural resources and food producing ability. However, its greatest single ingredient is perhaps its pervasive volunteer spirit. Alexis de Tocqueville made this observation when writing about this new nation in the early part of the 19th century. Take that spirit out of the equation and depend upon the government to fulfill the works of the volunteers, and the result would be social and economic catastrophe. That volunteer spirit is at the heart of the creation of Bonnet Springs Park. Enabled by the generosity and love of community by the Carol and Barney Barnett family, volunteers have stepped up to perform the myriad tasks to transform this complicated and degraded 200 acre railyard and former industrial area to world-class community assets. Complimenting the volunteer efforts has been the cooperation and assistance of the City of Lakeland and numerous businesses making in-kind contributions of goods and services. This combination of public/private cooperation is what makes America click. This was paramount in the thinking that led to the building of the monumental “Tribute to the Volunteer Spirit” on the east shore of Lake Mirror. That Albert Paley sculpture was intended to honor, and more importantly, to celebrate the uniquely American volunteer spirit present since its beginning. The large, colorful sculpture with its yellow ribbon and explosive spires was meant to appeal to young people, as a means to remind and inspire them to continue this volunteer tradition in this community. Begin now with a membership in Bonnet Springs “Friends of the Park”, recently formed as an advocacy group (www.BonnetSpringsPark.com). Bonnet Springs Park is happening! Serious site work and remediation begins in March, with opening scheduled December, 2020. Thank you for becoming an important ingredient. You matter! Mission Statement: The Friends of Bonnet Springs enables and promotes programs which enhance the park as a place of natural beauty, recreation, education and culture. We look forward to unveiling our Founding Friends of Bonnet Springs Park membership (fingers crossed) in April. 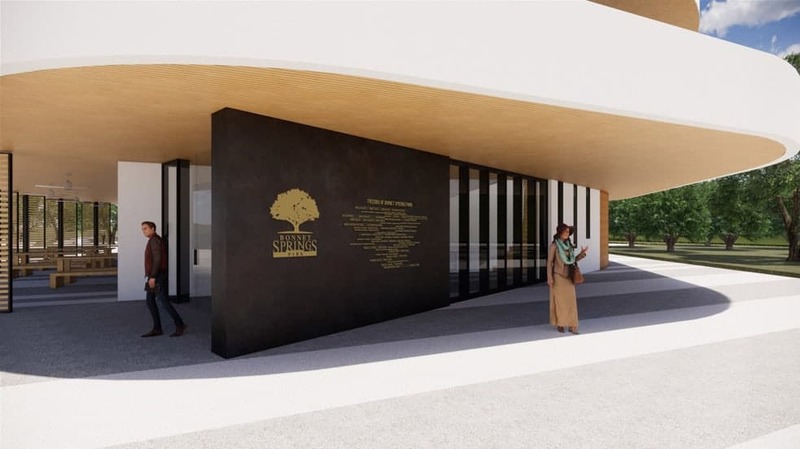 We have had SO many of our fellow Community members show the same kind of excitement and enthusiasm for BSP and we feel certain that this will give us all the opportunity to begin spreading the word about the Bonnet Springs Park and how it will transform our Community for generations to come.